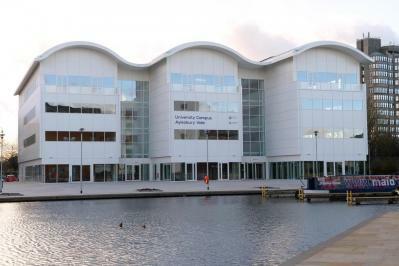 University Campus Aylesbury Vale has completed the Waterside South development, which includes the theatre, Travelodge and Waitrose. The £16.5 million project aims to stimulate further economic growth in Aylesbury and across Bucks by offering a number of courses which are directly linked to meeting skills needed by local industry. The education centre, which will be run by a partnership of Bucks New University and Aylesbury College, will welcome its first students in the new year. Its initial portfolio of degree and foundation degree programmes and training courses is geared towards the needs of the local business community, offering specialist courses in information security, organisational resilience, risk management, digital forensics and project management. The campus has been constructed by Morgan Sindall on schedule and was handed over to the tenants in November 2015. View the time-lapse footage. Improvements have also been made to the outside space including a new public square next to the canal basin, which has improved access to the whole of Waterside South from Walton Street and encourages greater use of the canal and towpath. In the future, the new building will also provide space for two new public restaurants and a café. Find out more about University Campus Aylesbury Vale.